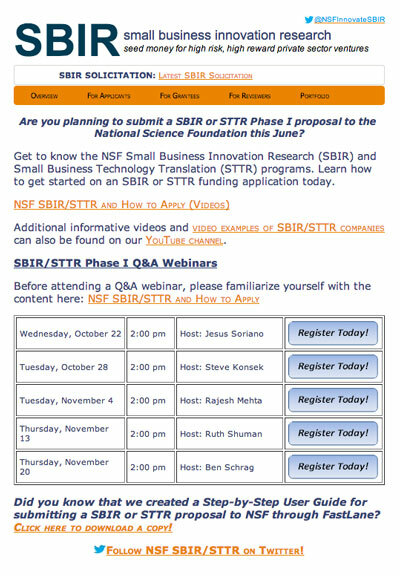 This fall, the NSF will host a series of informational webinars for individuals who are interested in applying for funding through the Small Business Innovation Research (SBIR) and Small Business Technology Translation (STTR) programs. The free online sessions will help prospective applicants navigate the proposal process and get started on their applications. In addition to information on the webinars, the NSF’s website also offers links to YouTube videos about the SBIR/STTR program and user guides for developing and submitting applications. Click here for more information or to register for an upcoming webinar.